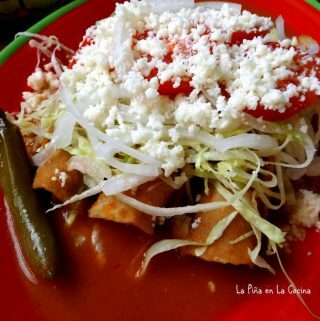 The tacos above were cooked a little more crispy than traditional tacos de canasta. 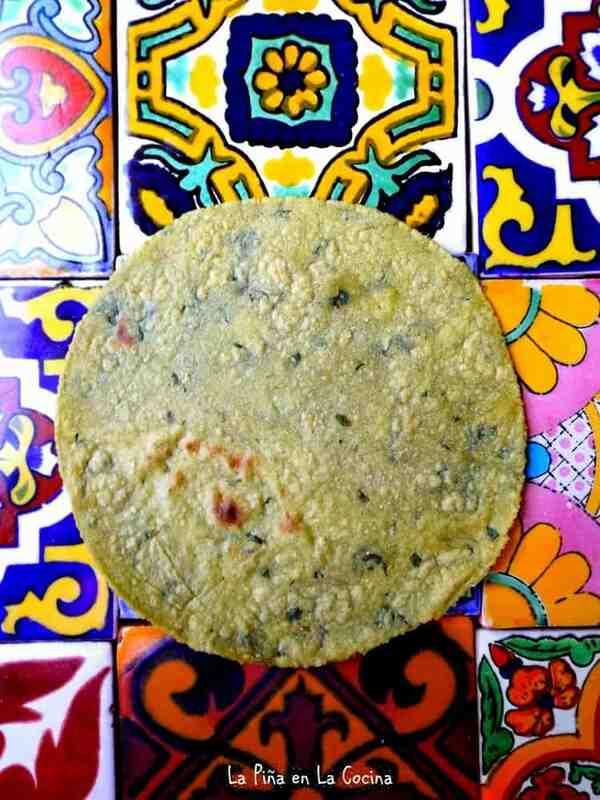 The tortillas should just be soft and pliable more like the new picture below. 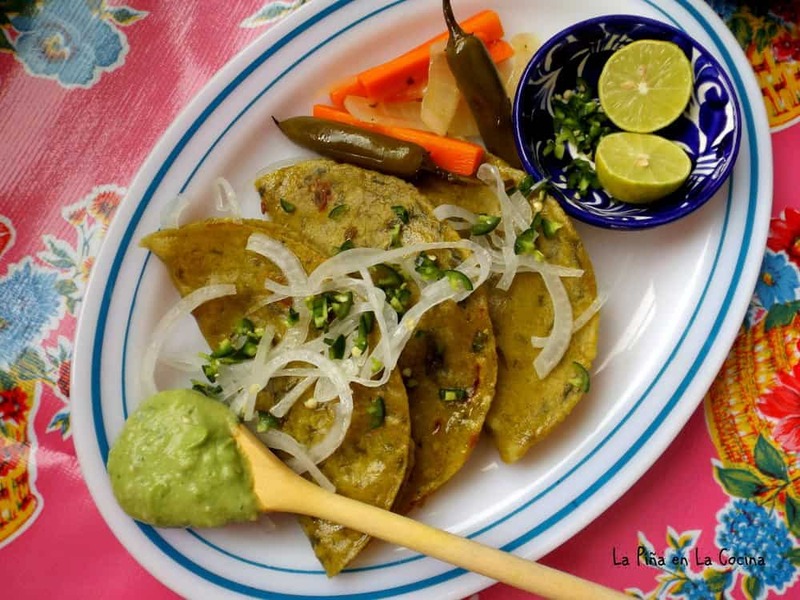 This quick version of Tacos de Canasta can be prepared any night of the week. Preheat broiler to high for 5 minutes. Add poblano pepper to baking sheet and cook under the broiler for 5 to 6 minutes per side. Remove from broiler, cover with kitchen towel and let cool. In a large skillet, preheat the oil to medium heat for 3 to 4 minutes. Add the potatoes and lightly season with salt and pepper. Cook for a good 8 to 10 minutes, stirring as needed. 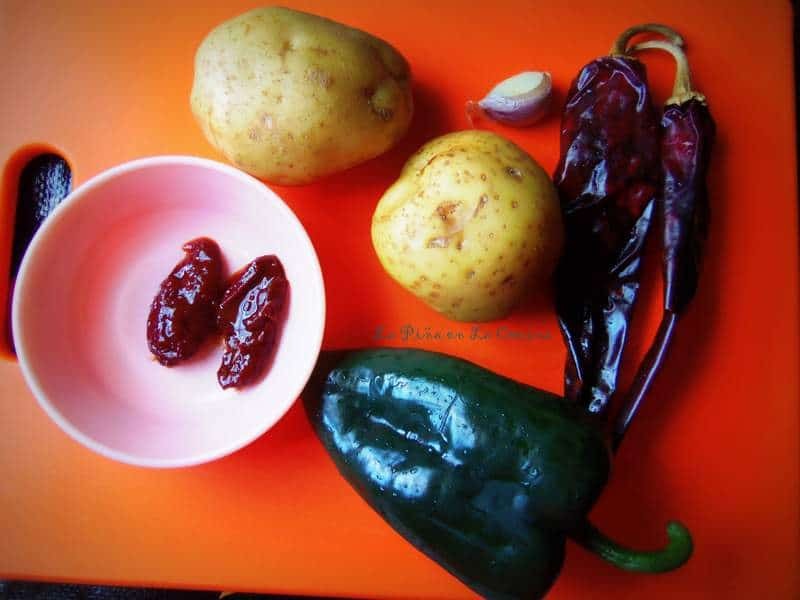 While the potatoes cook, remove the stems and seeds from the guajillo peppers and tear them into smaller pieces. Transfer to a sauce pan of simmering water. Cook 8 minutes. Remove from and let the peppers steep and cool slightly. Add the onions and garlic to the potatoes and continue cooking for 3 minutes. Peel the blistered skin from poblano pepper, remove stem and seeds and dice. Add the poblano to potato mixture. Drain the guajillo peppers and transfer to the blender. Add chipotles, cumin, oregano, paprika, vinegar and chicken broth. Blend on high until smooth and pour into the potato mixture. Stir well to combine, taste for salt and continue cooking for another 6 to 8 minutes or until sauce reduces. Preheat a large comal or skillet to medium heat. Brush the corn tortillas on one side with oil. Lay them, oil side down onto hot comal. At the same time, add 1/2 cup of oil to a small sauce pan and heat to medium. Fill one half of tortillas with filling and some cheese. 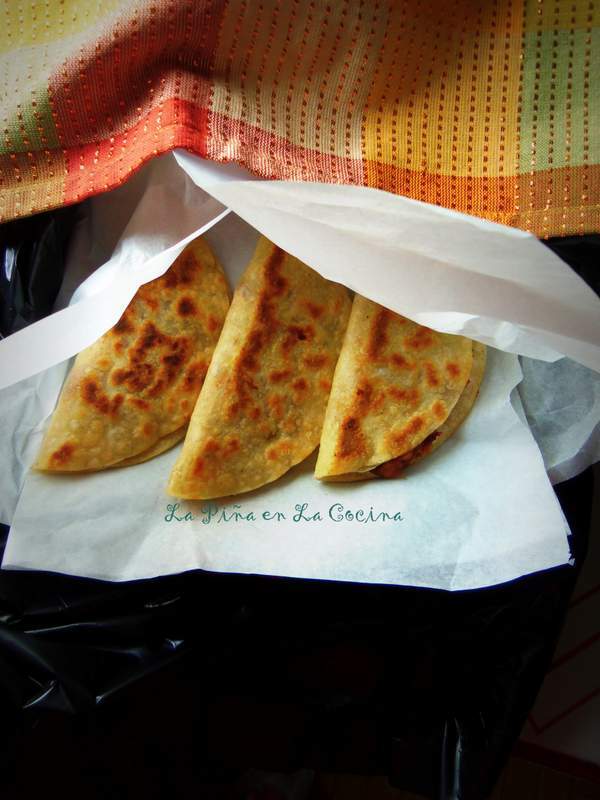 After 20-25 ceconds, fold tortilla close to form a taco. Continue cooking until tortillas just soften on both sides. Add half of the onions to the bottom of pot lined with paper. Transfer the filled tacos to the pot on top of onions. After all your tacos are filled layer them in the pot lined with paper. Add remaining onions to the top of tacos. Carefully spoon on the hot oil over the top over onions and tacos. It should sizzle a littel bit. Fold in the sections of paper to cover tacos completely. Ad a few more folded sections of paper, then a kitchen towel. Cover pot with lid and place into a large plastic bag. Let sit for 30 minutes before serving. 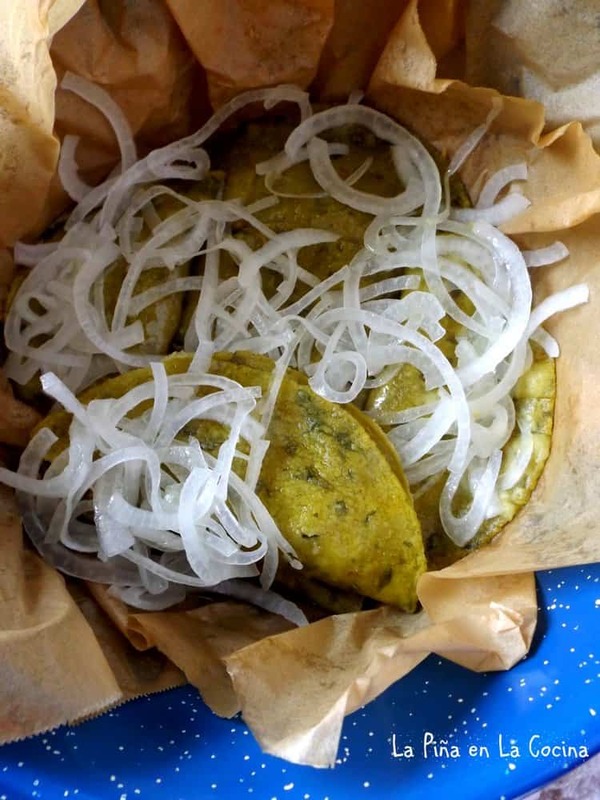 Garnish tacos with softened onions and fresh garnishes. This is a quick, homecook's version of tacos de canasta. To give the tacos that little red tint of color, you could infuse 1/2 cup of warm oil with 2 dried chile guajillo torn into pieces. 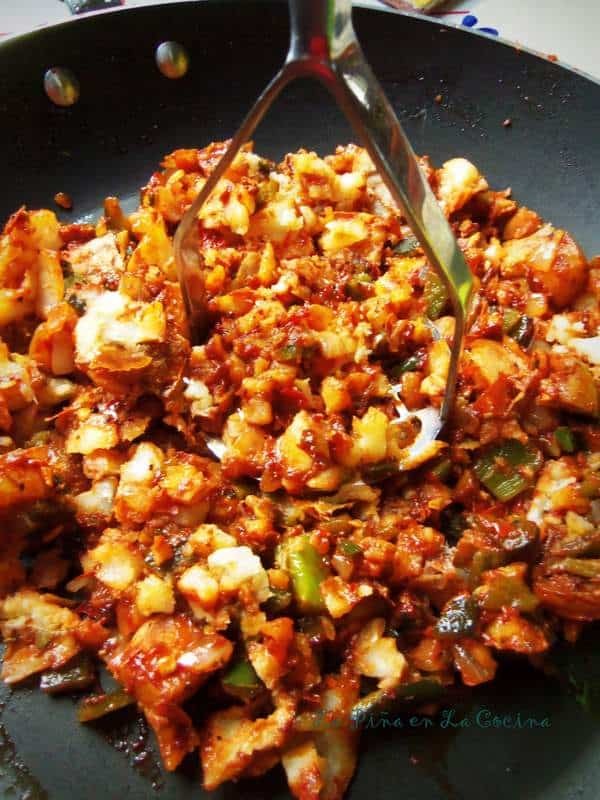 Use this oil to brush tortillas before cooking and filling them. 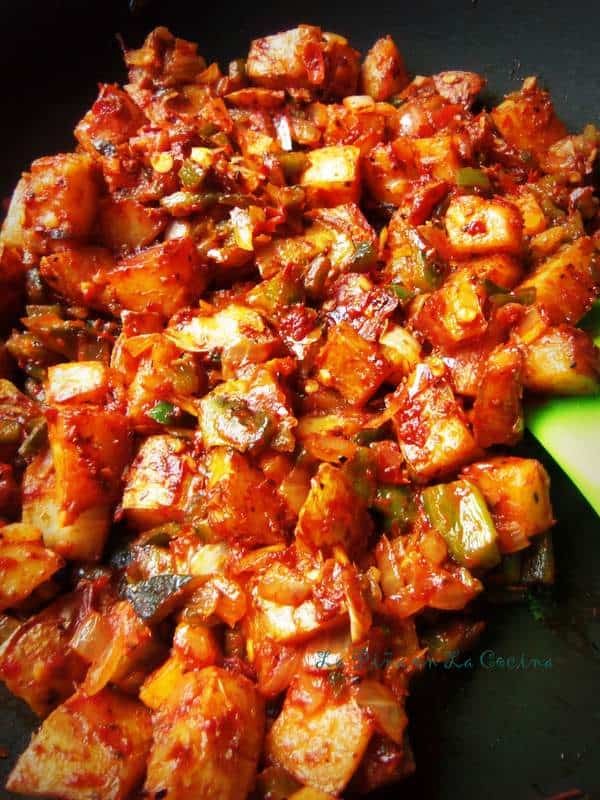 Any of the more mild dried pepper varieties can be used for this recipe. 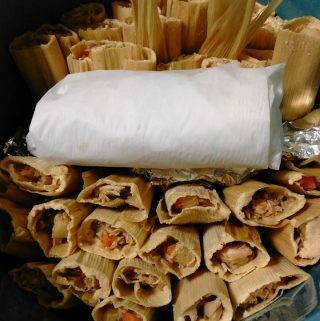 Besides potato and cheese, some of the other popular fillings would be beans, chicharrones and nopalitos. 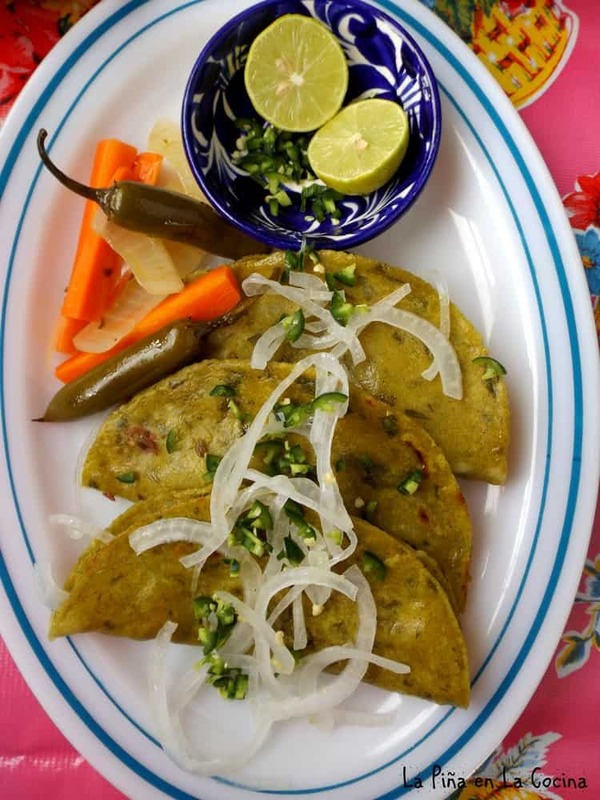 Potatoes with cheese and chiles is a popular meatless option in Mexico. It is enjoyed year round and not just for lent. The picture above is from the first time I prepared tacos de canasta. Since then, I have learned more about how they are prepared. You can see the difference in the picture below. I had some homemade cilantro infused corn tortillas, so I used those. 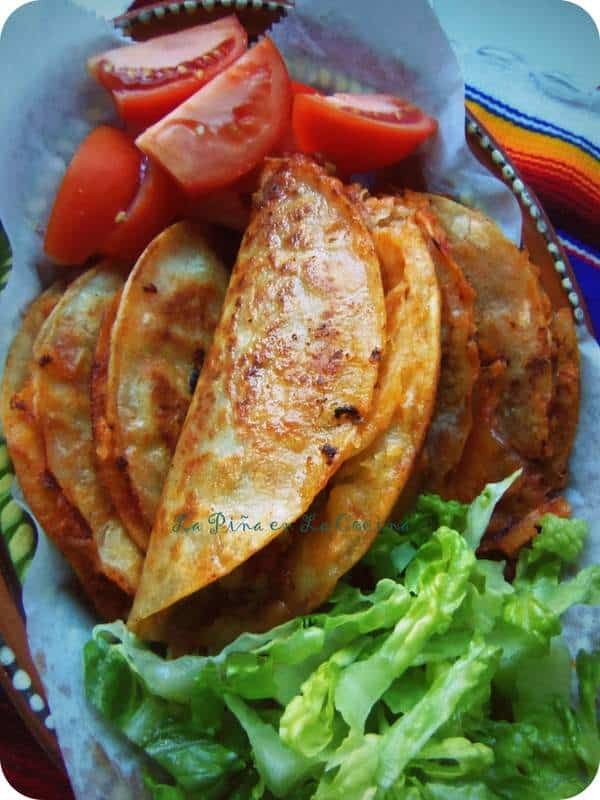 The tacos below are filled with my recipe for Chile Con Carne y Papas. Garnished with Chiles en Vinagre. My salsa of choice for this version of tacos de canasta is Avocado Salsa with jalapeños instead of the habanero in the original recipe. 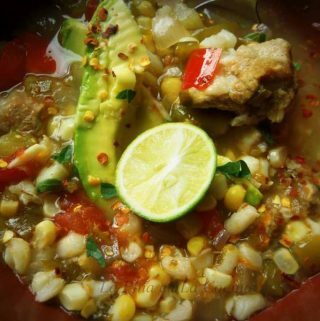 Ileana, it’s just one of those traditional Mexican dishes. I don’t know if I could explain clearly why they do this. I know that the oil poured in helps finish cooking the tortillas and gives them a better texture. And the 30 minutes steaming in the layers of paper and the plastic bag make them softer. 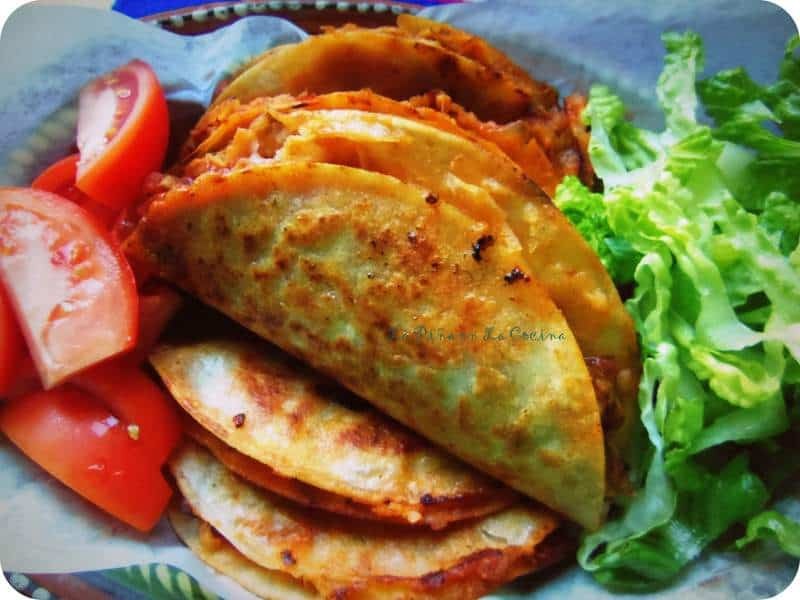 The original tacos de canasta were sold by ladies carrying baskets on the streets in Mexico. One of the most original street foods.